Crazyfly Quick-Release with Chickenloop is the stock part that comes with all 2018 Sick Bars. Though very similar looking to the 2014, the inner mechanics were changed to be easier to put back together once released. The built in swivel and smooth-release make this one of the cleanest and most simple systems on the market. 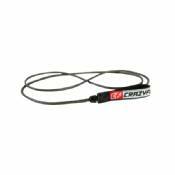 The 2010-2014 Crazyfly Depower Line is the double-duty line on the 2012-2014 Crazyfly Sick Bars which acted as both a dual-line Depower line and Sheeting Strap. 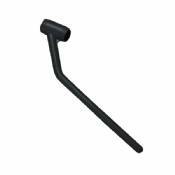 These wear down over time, and it's a cheap and easy part to replace to ensure your bar ist strong and top notch. 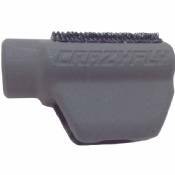 The Crazyfly Cleat is their unique cleat for the Trim-line (Sheeting strap) on 2015 kites and newer for the 2015 CrazyFly Sick Bar. 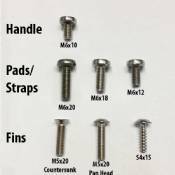 Choose which Crazyfly Kiteboarding Board Screws you need. Great replacement if you ever lost a screw on the water or during travel. Choice of handle, pads/straps, and fin screws for Crazyfly kiteboards from 2010 to the current model year. 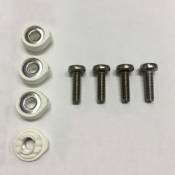 2016 Crazyfly Kiteboarding Hexa Binding screws and washers. Great replacements if you ever lose a screw on the water or during travel. CrazyFly Flyline set will replace any year Sick Bar. 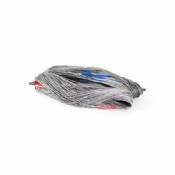 It includes 4x 24m lines of high-quality European-made Dyneema with a 700+ lbs. (320kg) test rating. 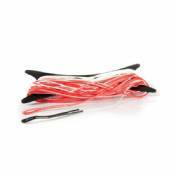 The Crazyfly front-line with Red Safety works on any year of Crazyfly Kite. 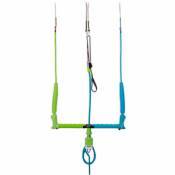 It is the center fly-line that has the specialized mid-line loop where the safety (bungee) line attaches. 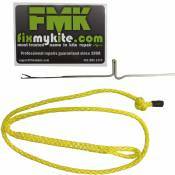 This product comes with the center fly-line and red safety (bungee) line. 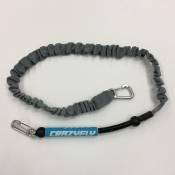 The Crazyfly Handle Pass Safety Kite Leash is their standard kite safety leash. It features a push-away safety release with 3-D sure grip for easy releasing with confidence the first time, every time. 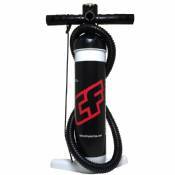 CrazyFly HP1 aluminum shaft kiteboarding kite pump made by GR. The New HP1 model includes a valve which can be capped for high capacity or removed for high pressure kite pumping. 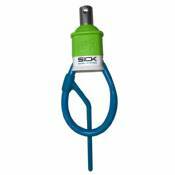 This new model also has a smooth handle for comfortable grip, PSI meter and several adapters for compatibility with most inflate valves.